Shane Esser teeing off at their first meet against Waseca. 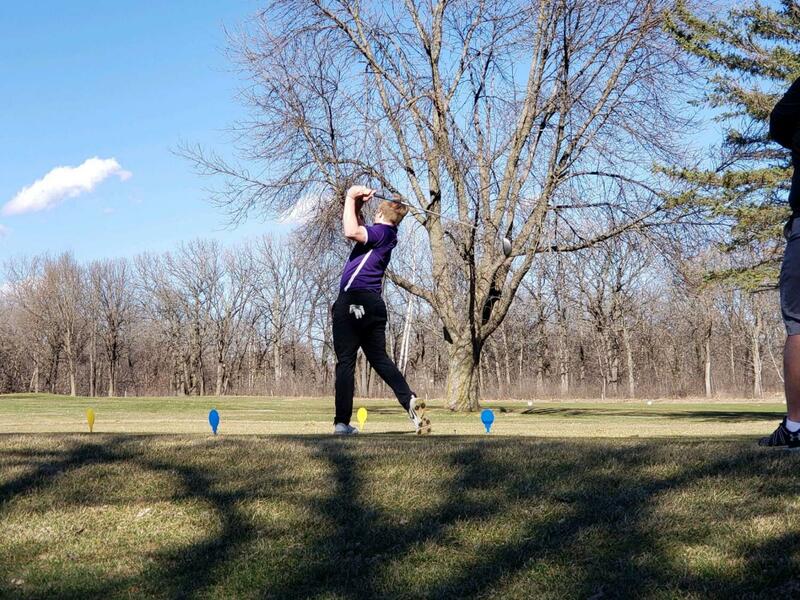 New Ulm Boys' Golf trumps the Waseca Blue Jays. Boys Varsity golf team teed off for their first meet this year on Monday April 8th. They had fantastic weather to start off the season. The Eagles got the dub over Waseca winning 177 to 210. Junior Glavine Schugel led the Eagles shooting 37 on the front 9 holes. Aiden Guggisberg came in second with 42. Kyle Esser contributed to the teams success by shooting a 47 and Josh Guldan hitting an even 50. The varsity players consisted of Glavine Schugel, Aiden Guggisberg, Kyle Esser, Josh Guldan, Ryan Esser, and Shane Esser. Varsity coach Dan Janke said, “We have a lot of returning players. Only one senior graduated so there are quite a few guys with varsity experience coming back.” Schugel and Guggisberg both qualified for the state tournament last year and are expected to lead the team this season. Guggisberg felt the wind was a factor in the game. Overall, he felt it was a good start to the season. The team hopes to do well in the conference and sections. Coach Janke feels it is realistic to win both if the team plays consistently. Underclassmen Kyle Esser, Josh Guldan, and Keagan Schiro are all expected to contribute the team’s success this season. Senior Shane “Jimmy” Esser said, “I was excited to get out and rip on the course with the boys today. It was great to get the game in before all the snow comes. God willing we’ll have a good season this year!” Be sure to come out and support the boys and girls golf April 18th at 1:00 pm!